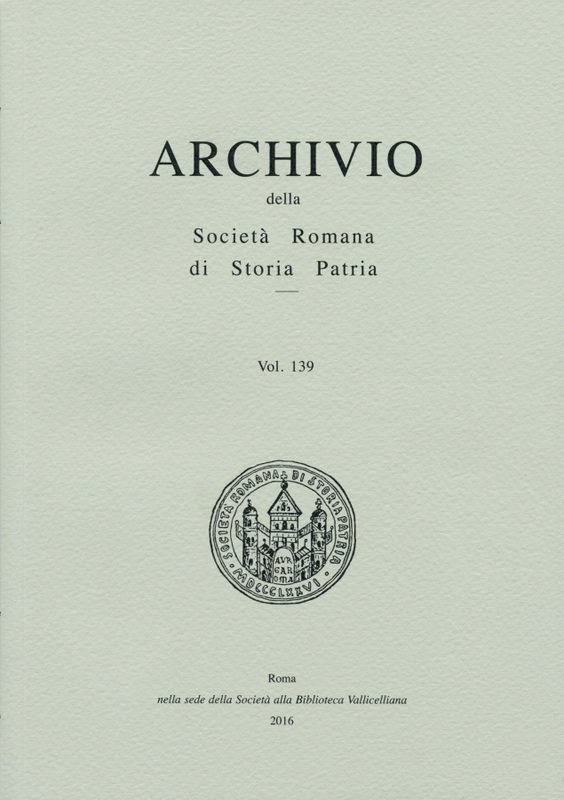 Origin and development of the phenomenon of personalisation in the chartae of the Roman scriniarii [records managers]. Over the course of the XII century the symbols that authenticated documents written by notaries in Rome and Latium became personal and unmistakably individual. The essay examines the origins and evolu-tion of these symbols on the basis of documentary and palaeographic evidence. The essay recreates the eating habits of Boniface VIII and describes how the papal kitchen and staff who prepared the pontiff’s meals were organised. Inventories conserved in the papal archives cast light on the pope’s expenditure on the foods and precious table ornaments (gold and silver dishes, drinking vessels and cutlery) in use on a daily basis as well on official occasions. Following the death of Sixtus IV (12 August 1484) Rome saw the start of negotiations amongst the cardinals to elect a new pope and disputes broke out between the Colonna and Orsini families. At the time Guidanto-nio Vespucci was in the city as ambassador for the Florentine Republic. His accounts are essential in recon-structing this tragic period of Rome’s history. The letters Vespucci sent to Florence between mid-August and mid-September 1484 are transcribed in the essay’s appendix. The Chellini family was native to Florence and moved to Rome in the early XVI century. Over the years the Chellinis became rich and important, partly as a result of successful commercial activities. The essay ex-amines the Will written by Caterina Chellini on 13 July 1686. Caterina was the only surviving member of the family and after her death (12 August 1687) all her property was given to the Sisters of the Venerabile Con-servatorio della Divina Provvidenza. The essay presents archive documentation on the Ligurian artist, Prospero Mallerini (1761-1838), who worked as a painter and artistic advisor to the court of Prince Francesco Barberini in Rome. Mallerini was an ancestor of Pope Pius XII (Eugenio Pacelli, 1876-1958). Merry del Val and the Accademia dei Nobili Ecclesiastici [Pontifical Academy of Ecclesiastical No-bles]. The Anglo-Spanish cardinal Rafael Merry del Val (1865-1930) held important posts in the Roman Curia over many years, notably as Secretary of State to Pius X (1903-1914) and Secretary of the Congregation for the Holy Office during the papacies of Benedict XV (1914-1922) and Pius XI (1922-1939). The essay por-trays relationships between Merry del Val and the Pontifical Academy of Ecclesiastical Nobles, where the Catholic ecclesiastical elite and members of the papal diplomatic corps are educated and trained.